The HGW-BX combines the controlling function of a very accurate weighing system with the mobility and the flexible availability of a hand pallet truck. 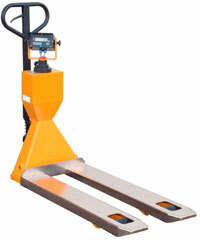 With the Bruss HGW-BX you weigh pallets and containers during transport, at the place of handling. You save time when checking incoming and outgoing goods and during the dosing and filling process. The HGW-BX is developed for use in EX-zones. 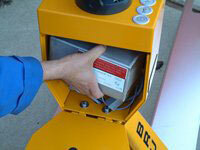 The system is equipped as standard with rotating indicator, large pushbuttons and stainless steel forks. The exchangeable battery module provides a use of 100 hours, and can be exchanged within the EX-zone.